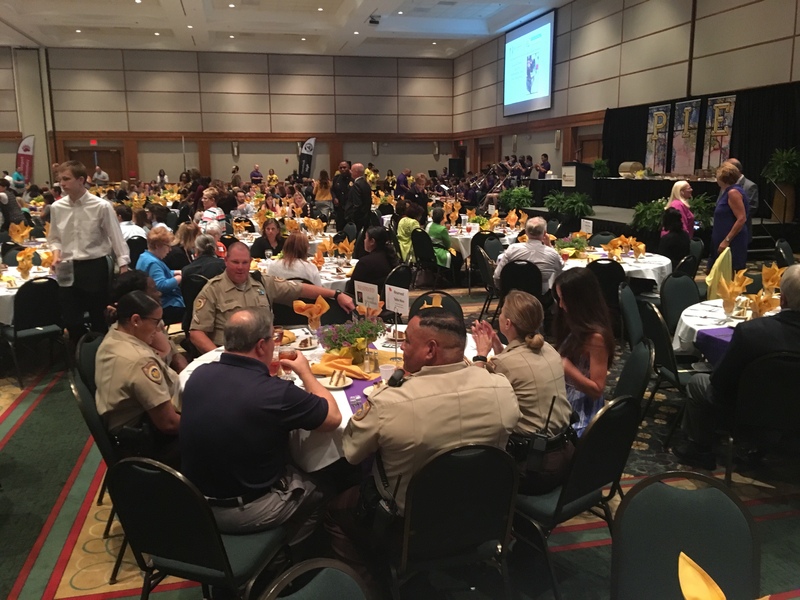 More than 700 educators, business leaders, and elected officials filled the New Bern Riverfront Convention Center on Tuesday afternoon for the sold-out Partners In Education Spring Luncheon. The annual event helps raise money for Craven County schools through PIE grant programs. The organization, Partners In Education is the local education foundation for Craven County Schools. PIE awarded more than $170,000 through a variety of grants and programs during the 2017-18 school year, PIE President Ervin Patrick said. Dr. Cecil Staton, Chancellor of East Carolina University, served as keynote speaker. Bircher said Dr. Staton comes to ECU from the University System of Georgia where he served as Vice Chancellor for Extended Education and as interim President of Valdosta State University. Previously, he served as associate provost, assistant professor, and university publisher at Mercer University in Macon, Georgia, and on the faculty of Brewton-Parker College in Mount Vernon, Georgia. He also served for 10 years as a Georgia state senator representing the state’s 18th District, and chaired the appropriations sub-committee responsible for the state’s $2 billion annual investment in public higher education. Dr. Staton is a native of Greenville, South Carolina. He earned his Bachelor of Arts from Furman University, a Master of Divinity with Languages and Master of Theology from Southeastern Baptist Theological Seminary in Wake Forest, and the Doctor of Philosophy degree from the University of Oxford in England. After Dr. Staton spoke, it was announced that PIE would offer a one-time grant of $3,000 to Craven County public school principals for the 2018-19 school year in Dr. Staton’s honor for speaking. The focus of the grant will be STEM, at Dr. Staton’s request. The Cheryl Marteney Memorial Volunteer Leadership Award serves to honor a volunteer who has made significant contributions through volunteer work with Craven County Partners In Education. This was awarded to Barbara Dotter, PIE volunteer. The PIE Outstanding Leadership Award honors outstanding leadership and significant contributions to education by school administrators. This award went to Deborah Langhans, Chief Academic Officer of Craven County Schools and Dr. Ervin Patrick, PIE president and Director of Human Resource Services. There were three PIE Excellence Awards. The award honors an individual or company for demonstrating a commitment to working with PIE to promote student achievement and educational excellence. This award went to Jason Jones, County Commissioner; B/S/H/ Home Appliances; and Wells Fargo. The Distinguished Alumni Award honors Craven County Schools graduates for their contributions to the community, their profession, and PIE. This award went to Patricia Rammacher and Michael Raines, Century 21 Zaytoun-Raines. Entertainment for the event was provided by Havelock High Jazz Band and West Craven Middle School #BucketRage.